Stella has been crafting Valentine’s for her classmates all week and while helping her I got to thinking about my days as a teacher not so long ago. I remembered back to the thoughtful gifts my students would bring me thought the year and how a little token of their appreciation would always go a long way. I thought it would be really sweet to give Stella and the boy’s teachers some lovin’ too, so I made a few lavender-filled sachets for them this weekend out of some sheets of felt I’ve had in in the back of our craft cupboard. Four years ago Andrew gave me a big bundle of felt squares in a rainbow of beautiful colors as part of a Christmas gift from Etsy during our 12 days of gifting that year. It was one of those gifts that really touched me because he hand-picked each of the colors for my bundle. Talk about a marrying my soul-mate! 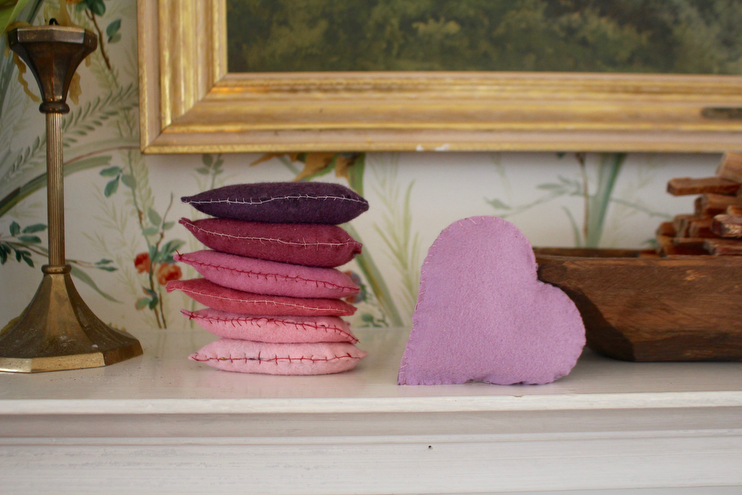 Over the years I have made all sorts of things with that felt – with these heart sachets using up the last of it. It just so happens that the only colors I had left were perfect for Valentine’s Day. I personally love the deep, rosy pink one and the mauve best, so I think I’ll keep those two for our sock drawers and give the to all the helpers at school. What is a sachet? They are essentially perfume bags you can use for all sorts of things! 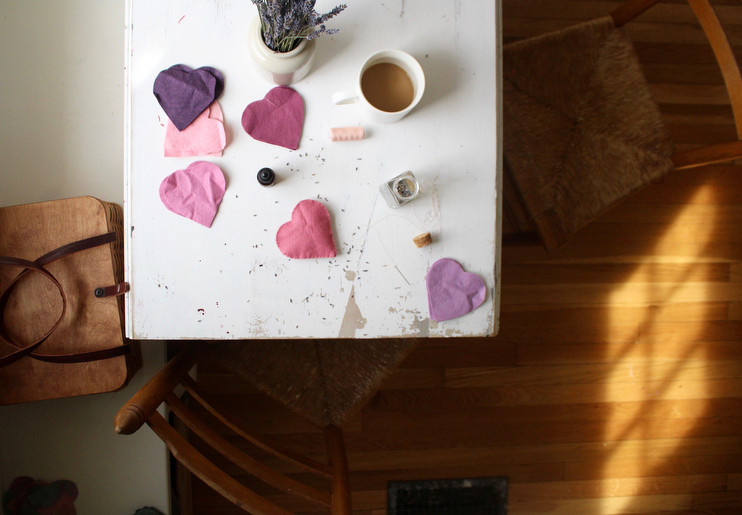 These felt hearts are filled with dried lavender buds, a variety of beans and a few drops of essential oils. They are sweet little gems you can tuck somewhere you want to keep smelling nice and fresh – a desk drawer, your car console, a pocket, your purse, a night stand, any clothing drawer, a pillow case, etc. You can put the essential oil inside the heart, or put a few drops on the outside felt when it needs a refresh. It may stain a little, but that’s alright. You could also leave the beans out, but I was running low on lavender flowers so I used them as a weight to bulk them up a bit. Below is a step by step tutorial to make these hearts sachets. You could do them in any shape of course, but I think the hearts make a perfect Valentine’s gift for those who care so much and work so hard for our babies. felt squares – Etsy is a good resource for this. dried lavender buds – I order here. essential oils – I used Joy, a floral blend made by YL but your favorite will do. Step 1: Gather materials and make yourself a nice cup of coffee or tea. Handwork projects are always more fun with something yummy to sip while you work. Step 2: Using your sharpie, trace two large hearts on the felt. I used a cookie cutter to keep things consistent. Step 3: Cut out the hearts with sharp fabric scissors. Step 4: Place the two felt hearts on top of one another and starting anywhere you like, sew a blanket stitch around the heart, leaving about an inch so you can fill it up. 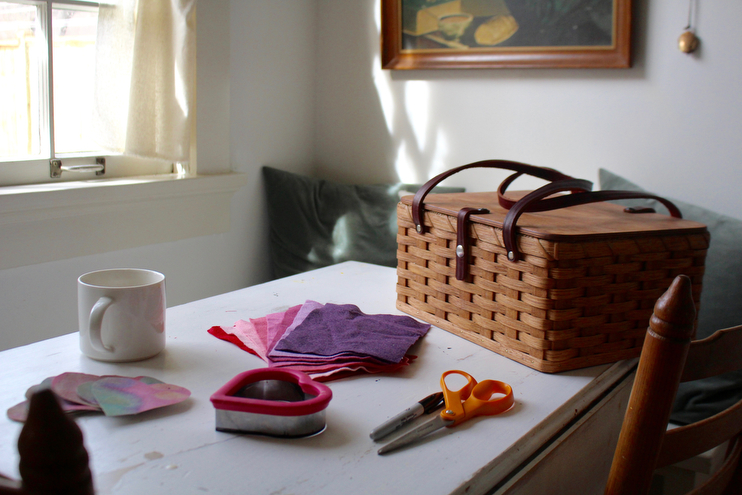 You can learn how to do a blanket stitch here, if you need a little guidance. I am 100% a visual learner so videos are really helpful. I used a different color of thread so a) I could see what I was sewing and not make too big of a mess and b) for a pretty contrast. Make sure to use good quality thread for this and keep the stitches fairly close as you go. It makes a big difference. Step 5: Fill your hearts with either a) dried lavender buds or b) a mixture of dried lavender buds + dried beans. Your choice. Before sewing up the heart, put five drops of essential oils inside on the flowers. You could do this to the outside if you want, but it may stain. Step 6: Sew it up, double knot it, and give yourself a pat on the back. Step 7: Make a few more for yourself and for loved ones. As you can see, my stitching is far from perfect, and there are too many mistakes to count, but I think they are pretty sweet. Don’t let yourself be intimidated by getting everything just so. Handmade gifts are beautiful because of their imperfections.